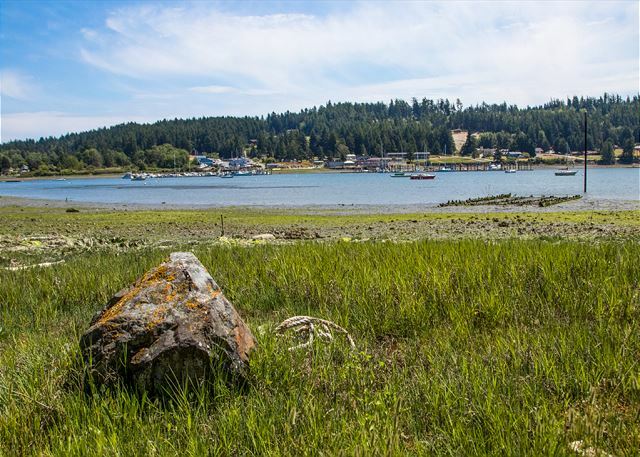 View looking toward Lopez Village across Fisherman Bay. Here is the view from the new outdoor deck area with new dining table furniture. 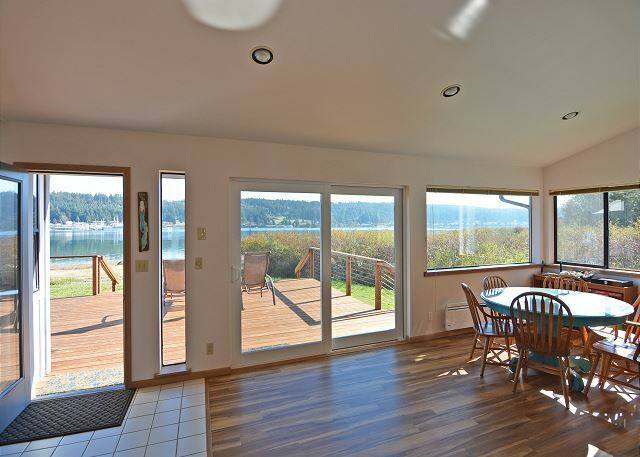 Lounge chairs sit to the right on the other end of the deck which extends virtually the whole length of the house. Looking the length of the waterside deck. Perfect for morning coffee. Note the new BBQ installed this year. 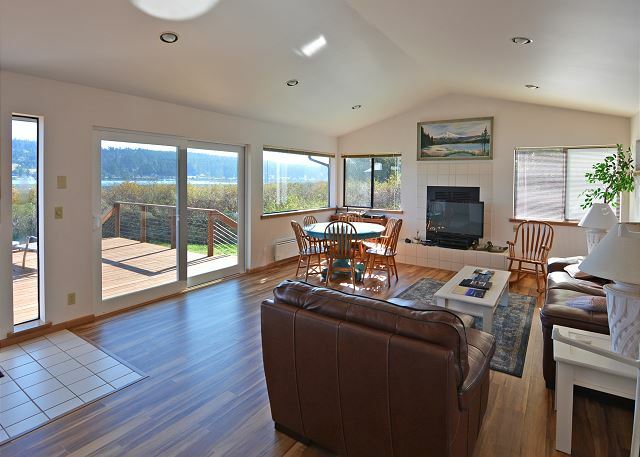 The house sits directly on Fisherman Bay with easy access to the water. Here is the bay at low tide. 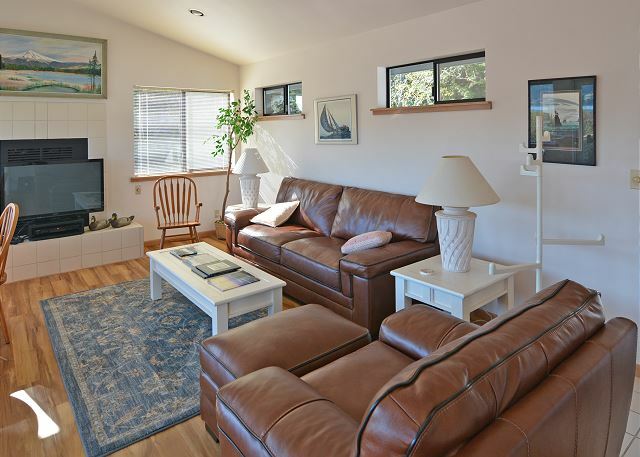 When at Fisherman Bay Retreat you will be able to enjoy this extremely comfortable living room and furniture, all while enjoying the wonderful view. 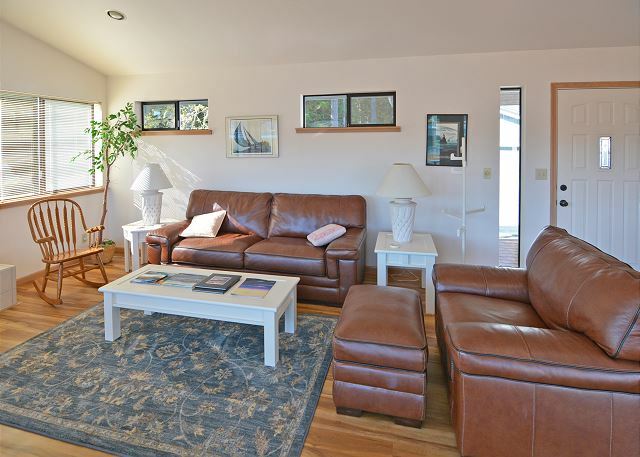 From the living room, there is an expansive view of Fisherman Bay, with walkout water access. 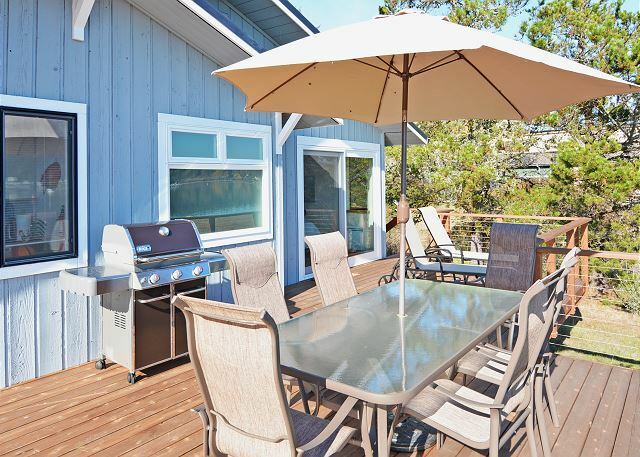 The well-equipped kitchen will welcome you when making your vacation meals. 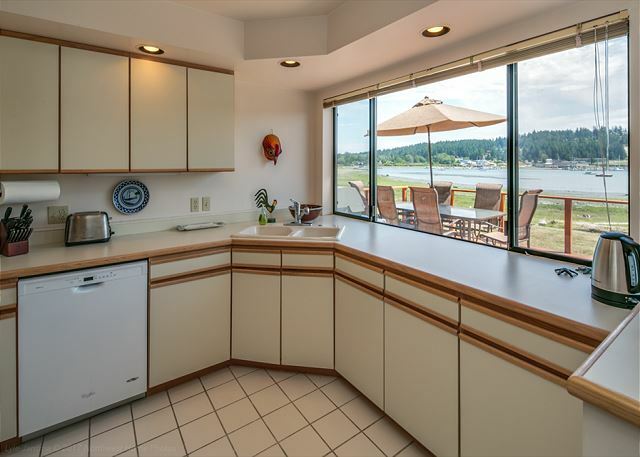 Enjoy the view while creating your culinary delights! 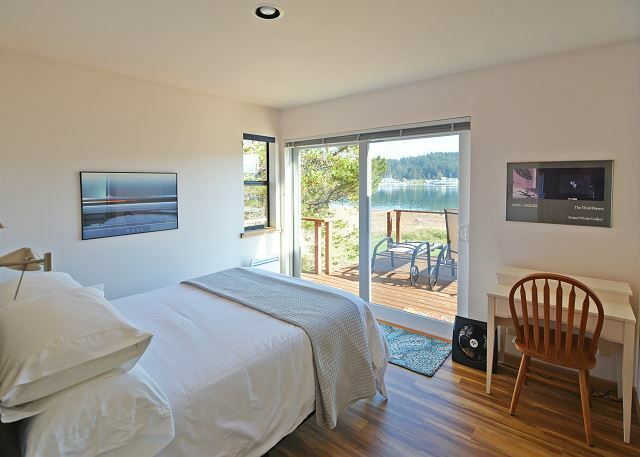 Your master bedroom with its view of Fisherman Bay and access to the front-of-house expansive deck. 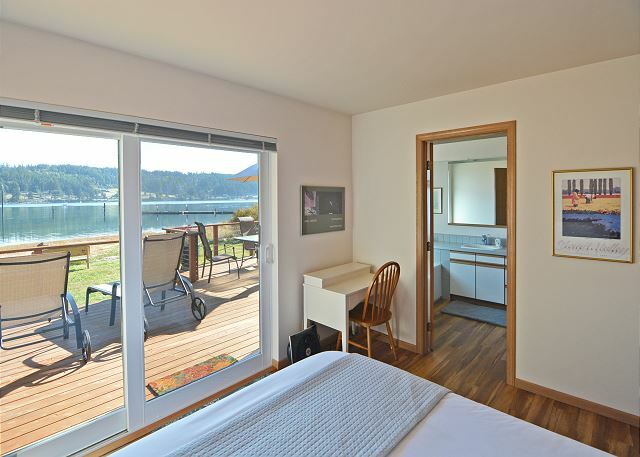 More of the view from the master bedroom, with the master bath through the door. 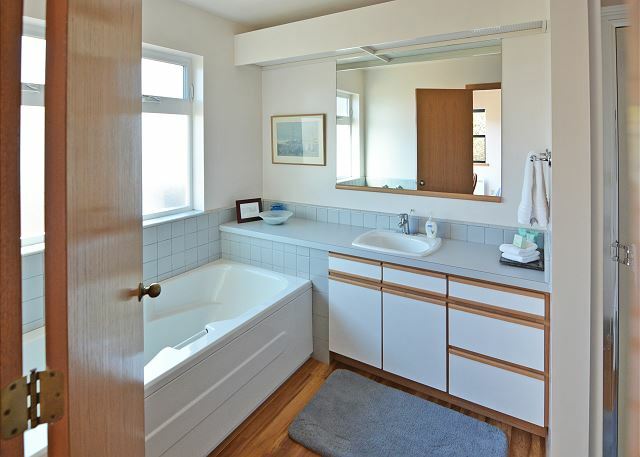 The master bathroom with soaking tub and separate stall shower. 2nd bedroom with new queen bed off main hallway. Books to read anyone? 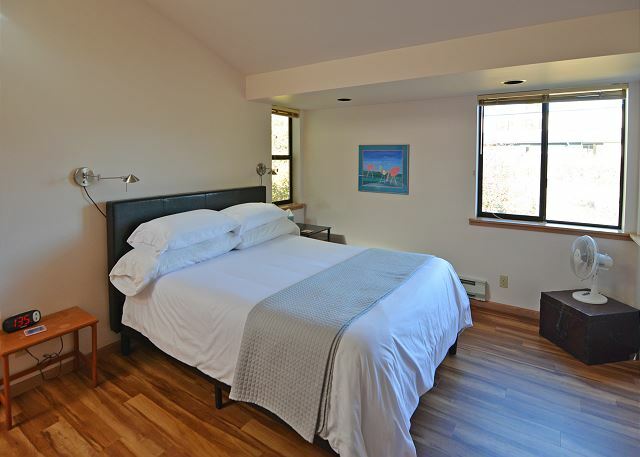 Another view of the second bedroom with queen bed and new hardwood floors. 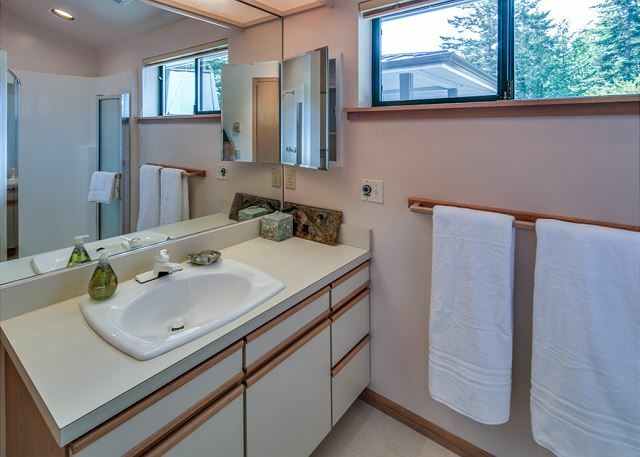 The second bathroom will make sure your guests are taken care of as well. Provides a stall shower for guests. Another picture of the second bathroom with stall shower. 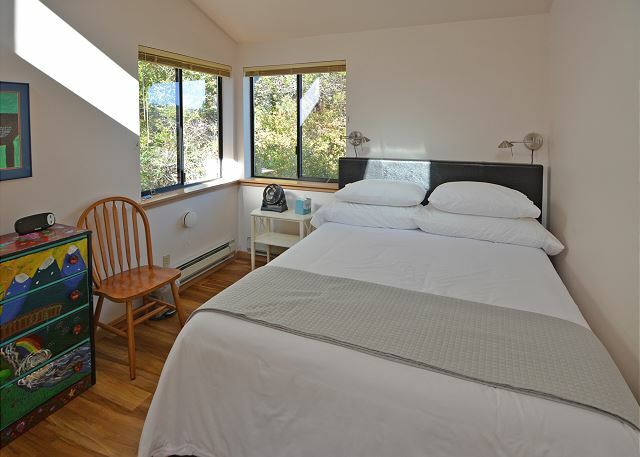 The third bedroom is at the back of the house and is the quietest for those light sleepers. A beautiful spot at water level for great views. 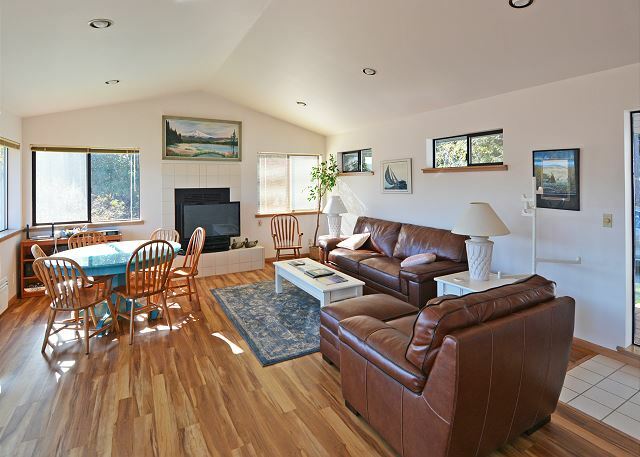 This is a wonderful house, not a cabin, with a great kitchen and fine bathrooms and bedrooms. 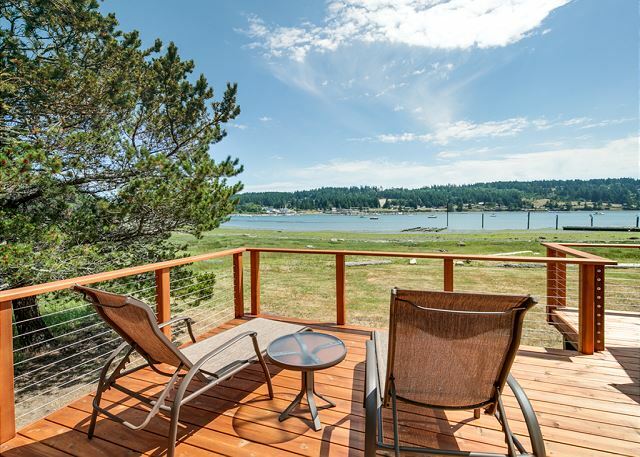 Great weather, nice accommodations, great views. 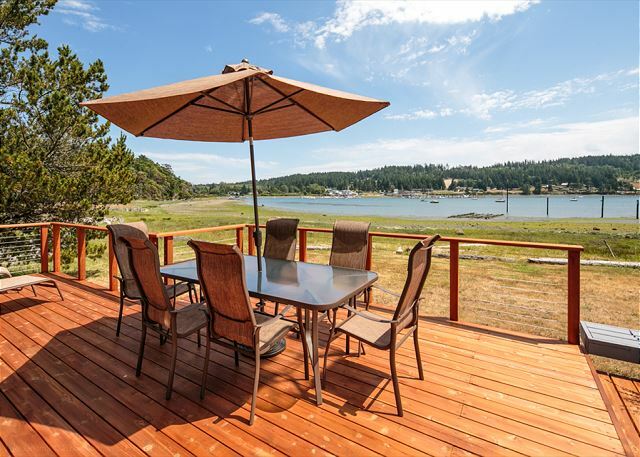 The weather was great, nice breeze, great view and very clean and nicely apportioned home. The only down side was that there was a 1/2 mile long gravel road to get to this property. This was only an issue as we has road bikes which don't do well with gravel. Not dusty, just had to transport bikes to the paved county road. Lopez Is. is a great place to cycle. 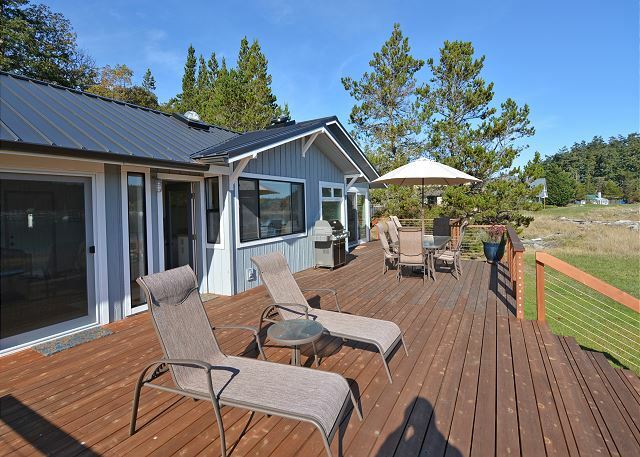 We came to Lopez for a cycling weekend and after a lovely drive along a beach spit then thru the woods, Im glad we found this comfortable, well appointed vacation home. 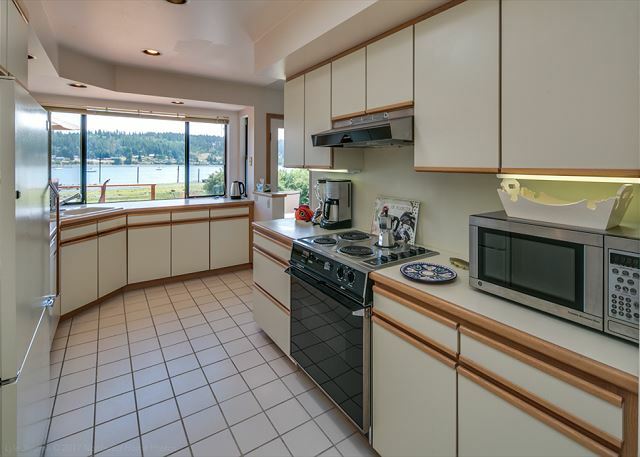 We loved the large kitchen layout w plenty of counters to spread out our snacks and the spacious living room area that opened out onto the deck area. Though our weekend stay was cloudy & misty we could see how much the patio deck would be used when it its sunny. 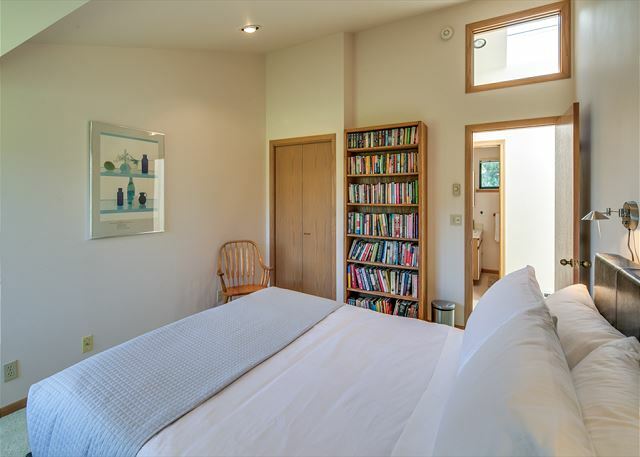 The bedrooms had comfy beds and great reading lights w dimmers so one could read & not disturb anyone. We found the instructions and follow up fr the property management company very organized and professional inc a followup check-in. We would recommend & stay here again. We loved the rental . 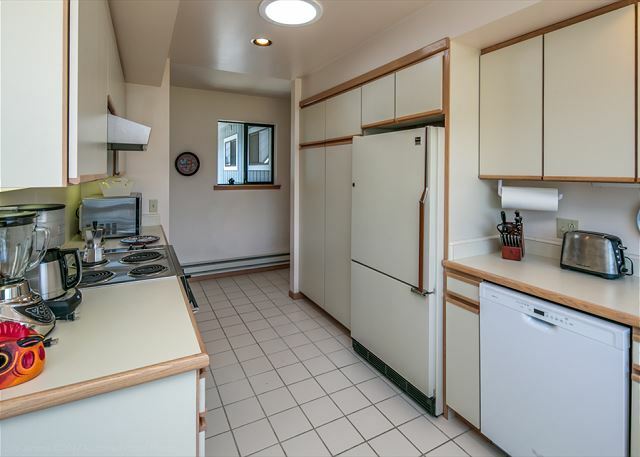 It was in a great location, the kitchen had everything you need, the beds were very comfortable. We will be back.